CHEEKY Liverpool Dreamboys & Cocktail Making Hen Party! One of the favourites, this Liverpool Dreamboys and cocktail making hen party bundle is bound to create a hen party night to remember, with two unique experiences combined into one perfect night. Celebrate your hen night with drinks, food, a great party atmosphere and of course…the men! This hen party bundle lets you sit back, relax and have all the hard work done for you so you and your hen group can have an unforgettable time. Kick off your hen party with a unique cocktail making class on a modern Liverpool bar, great for getting all the girls involved mixing, shaking and muddling some old classics and favourite cocktails with some helpful tips from a professional bartender. The whole session lasts around 90min – 2hours, giving you enough time practice your new skill and try your creations. 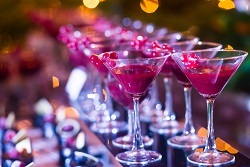 Everyone in your hen group will receive a complimentary drink on arrival, before testing some profes­si­onally made cocktails and flavours and then making 2-3 delicious cocktails each with all the equipment that’s provided for you. We’ve also added a light food buffet that you can enjoy in reserved seating to go with your drinks, or you can add a full a 2 or 3 course meal to complete the activity and soak up all that alcohol. The Dreamboys male strip show is the most famous UK cabaret show and has been going for years, making sure the audience receive the best experience possible and enjoy the whole night. A Dreamboys hen party activity gives you the chance to not only watch these hunky men on stage performing, but also meet and greet them with the opportunity to take pictures, chat and have autographs signed. Then enjoy what you came for, the Dreamboys male strip show hen party activity which never fails to impress, giving you and your hen group the chance to have some laughs and enjoy the unique experience to celebrate. If all of this isn’t enough, we’ve also thrown in FREE nightclub entry to the most popular city centre nightclub in your location to help you carry on the party! Are you thinking the Liverpool Dreamboys and cocktail making hen party bundle or one of our other Liverpool hen party bundles is perfect for your hen do? Call our events planners on 0161 341 0052 and let them create your dream hen do activity for you.